How do you make the best pulled pork sandwich in Chicago? Combine your favorites into one. We like our pulled pork in sandwich form—it’s portable, it’s got a more complex flavor, and it’s the only way to eat it with our hands and still look civilized. While the perfect pulled-pork sandwich is a matter of taste, this fantasy specimen, dreamed up using sandwich elements from various spots around town, is our vision of the ultimate. Is this sandwich impossible to obtain? No. You just have to order five sandwiches—from five restaurants—to make it. Luckily, not one of them is a loser, so you’ll have plenty of options for the leftovers. BREAD The go-to bread for most pulled-pork sandwiches is some sort of soft roll, usually no better than your standard supermarket hamburger bun. Fat Willy’s Rib Shack (2416 W Schubert Ave, 773-782-1800; $8–$12) has the good sense to use a heartier, crustier bread—one that provides a textural contrast to the soft pork and doesn’t get soggy halfway through. ONION STRINGS An unconventional addition, for sure. But these fried onions from the Piggery (1625 W Irving Park Rd, 773-281-7447; $7) provide all the crispiness that coleslaw promises but so rarely delivers. Barbecue purists may scoff, but we think these crunchy strings should be standard. PORK Everything at Big Ed’s (2501 Martin Luther King Jr Dr, North Chicago, 847-578-1901; $8) is great, and the pulled pork is no exception: tender but still toothsome, with sweet caramelized bits and notes of smoke that greet you at the end, rather than overpower you in the beginning. 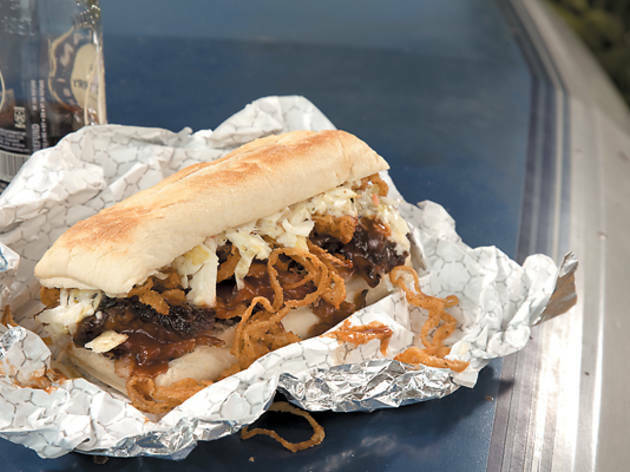 COLESLAW Honey 1 BBQ’s (2241 N Western Ave, 773-227-5130; $8) coleslaw comes standard on its pork sandwiches. It tastes like a lot of other coleslaw around town, but its small-chopped texture makes it more like a condiment and less like an awkward salad. SAUCE Smokin’ Woody’s (4160 N Lincoln Ave, 773-880-1100; $9) brick-red sauce delivers what a pulled-pork sandwich needs: a peppery (and graciously unsugary) bite to cut through all the fat.